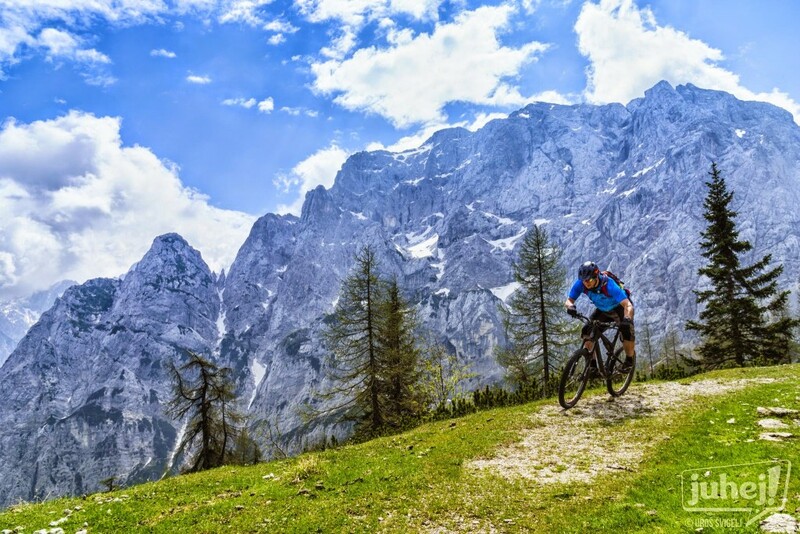 Trans Slovenia 01 - The best MTB tour: From Julian Alps to the Adriatic! The Trans Slovenia 01 biking tour combines the landscapes of the Julian Alps and those of the Mediterranean in only 7 days. It starts with a winding ascent to the Vršič mountain pass, which is the highest lying road pass in the eastern part of the Julian Alps. The high-mountain road features 50 serpentines, of which 26 on the descent towards the Soča valley. 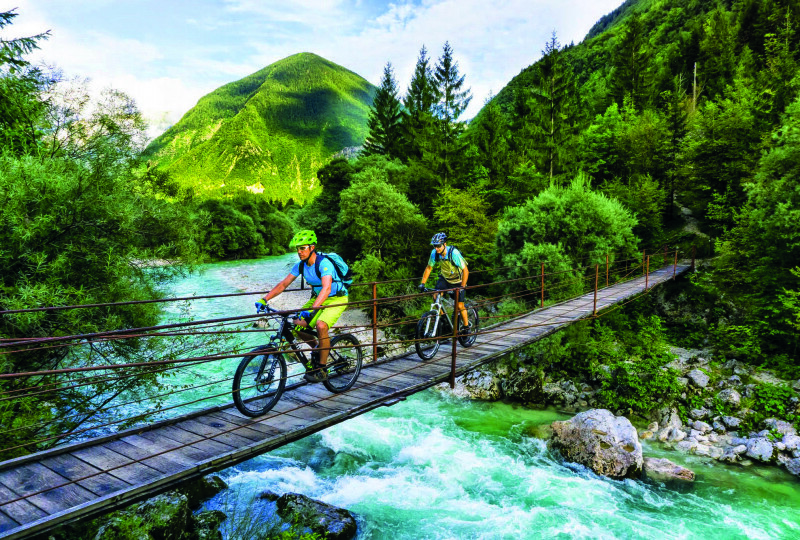 The tour continues along the Soča river, which has a distinct emerald green colour and is considered to be one of the most beautiful rivers in Europe. The Soča valley was the first destination in Slovenia to earn the title of the European Destination of Excellence (EDEN) due to its sustainable development in tourism. Make no mistake – the many “detours” are taken to reach the peaks offering majestic views and tonnes of biking pleasures are guaranteed. Mt Stol, which stands at the edge of the high Julian Alps, offers a splendid view over the sea. The descent is taken along a single long epic trail through the woods. The stunning two-hour descent from Mt Matajur is one of the highlights of the tour. It leads to Italy, where the group will take a break and try some delicious ice cream. 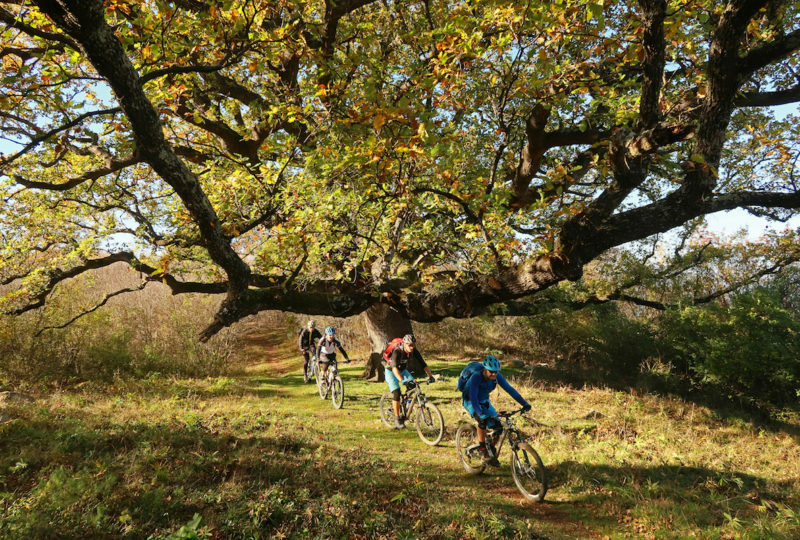 After that, the tour leaves the mountains and enters the land of gentle, rolling hills covered in orchards and vineyards and dotted with small, secluded villages – the region of Goriška Brda reminds of Tuscany. The wine growers of Goriška Brda are famous around the world for their high quality wine, and any wine connoisseur would recognise many of the names displayed along the road winding through the landscape. Wine tasting is obviously inevitable here. Did you know that the noble whiteLipizzaner horses originate from Slovenia? The original stud farm has been set in Lipica, in the Karst region, since 1580. This is where the tour makes a stop after passing most of the Karst region and before descending towards the town of Piran, a small slice of Venice in Slovenia. “Slovenia for most riders is still a relatively unknown land, with stunning and varied landscapes between the striking Julian Alps, the romantic Soča valley, the lovely Brda wine region, the unique karst area and the sunny Adriatic coast – all connected with many old Military streets from the First World War and magical, completely unknown trails. Trans-Slovenia is a new, not too heavy, exclusive TransAlp Tour for mountain bikers in five to seven stages, with many variations to suit all tastes – on gravel or trail, from easy to difficult, an orientation tour with a high enjoyment factor, a perfect combination of adventure, hospitality and fun.” By Uli Stanciu, pioneer of Bike magazine, Trans Alps tourism, BIKE Festivals Riva del Garda and Willingen and owner of www.bike-gps.com. We choose pleasant accommodations in hospitable and clean environments offering great, local food, so you can feel at home on your trip. We take care of accommodations in biker-friendly environments and provide bike repairs and bike wash as well as laundry service and safe bike storage. Support 24/7 – we can resolve any complications and difficulties during the tour. Personal experience and guidance – we have cycled all tours ourselves. We organise a Skype call to discuss all tour sections and details with you before every departure. 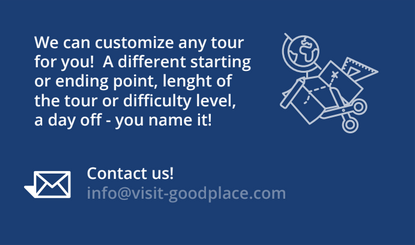 Comprehensive traveller information – before the departure, all participants receive a document with detailed information about the tour, i.e. bike repair services and stores, recommendations for lunch etc. Arrival at the beautiful alpine village of Kranjska gora situated at the foot of the Julian Alps. Many different easy hikes are available, and a short tour is provided for those early or/and eager enough to go biking as soon as possible. The tour includes a shuttle to the village of Arnoldstein in Austria, a pleasant uphill ride to Mt Peč and a nice descent back to Kranjska Gora. It is all about the three-border point (Dreiländereck), where the territories of Slovenia, Italy and Austria come together in a single point. The peak offers a spectacular view over the Julian Alps, the Gailtal Alps, the Gurktal Alps, the High and Low Tauern, and the western part of the Karavanke mountains. From Kranjska Gora, the road leads past Lake Jasna and through the glacier valley of Krnica to the Vršič Pass, which is the highest positioned road pass in the Eastern Julian Alps with its 1,611 m of elevation, allowing one of the most beautiful ascents in this part of Europe. For the most part, the tour avoids the main road and makes use of the gravel trails. The downhill part of the Vršič pass leads to the Trenta valley, one of the most remote but also very popular places in Slovenia, which is located at the heart of the Triglav National Park. It is also the uppermost part of the famous Soča Valley, the first place in Slovenia to be proclaimed the European Destination of Excellence (EDEN) due to its sustainable development in tourism. Flowing under the majestic peaks of the Julian Alps with the distinct emerald green colour of water, the Soča is considered one of the most beautiful European rivers. In addition to a plethora of beautiful natural sites, the valley keeps alive the shocking heritage of World War I, which is visible at every step. 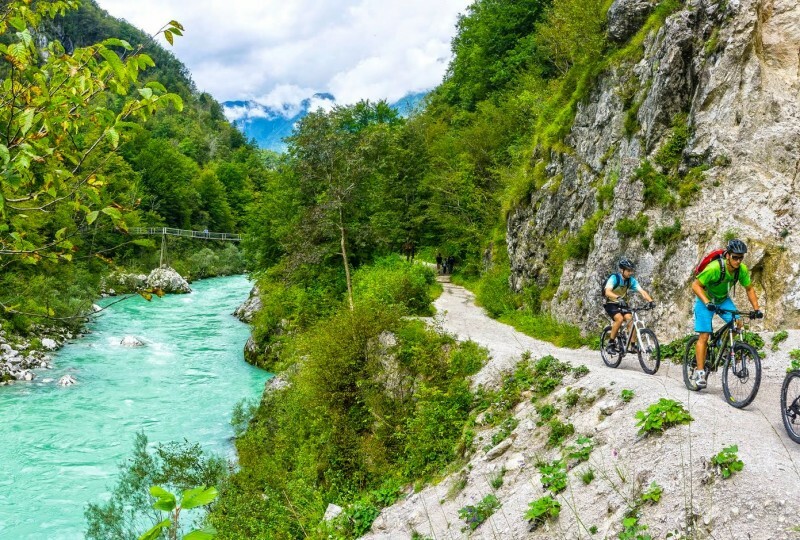 The source of the magnificent Soča River serves as the connecting point from where the tour follows the emerald river to the village of Bovec, which is known as the centre of outdoor sports. The remainder of the day is dedicated to exploring this idyllic location or taking a session at one of the zip-lines, which is provided by the local agencies. The day begins at the majestic Boka, the mightiest waterfall in Slovenia. The ascent of the day starts at the village of Žaga. A concrete road at the first part leads up to the border between Slovenia and Italy and, from there, a former mule-track road leads to the top of Mt Stol. Upon reaching the highest point, the incredible view of the Soča valley opens bellow. Standing at the edge of the high Julian Alps, Mt Stol offers a splendid view of the sea. The 30-kilometer limestone ridge rising above Breginjski Kot stretches from Kobarid towards the Italian border. The highlight of the day starts here, as the path goes along the ridge of Mt Stol, offering some amazing, breath-taking views. From there, a steep single trail leading into the forest descends right to the banks of the Soča river in the village of Trnovo. Enjoyment is guaranteed. Only a few kilometres of the winding road along the Soča remains for the tour to reach the small town of Kobarid, which is best known for the 1917 WWI Battle of Caporetto, where the Italian retreat was documented by Ernest Hemingway in his novel A Farewell to Arms. Today, Kobarid is a charming and lively tourist hub. Ready to unlock the next level? A long and steep ascent from Kobarid to the village of Krn and then onto the Pretovč mountain pasture make this leg of the tour the most demanding one. However, what goes up must also come down, and the effort more than pays off with a striking descent towards the valley of the Tolminka river, passing by the Memorial Church of the Holy Spirit, a monument dedicated to the First World War. Here, the tour comes close to the lowest point of the Triglav National Park and one of the most popular tourist spots in the region, the Tolmin gorges. Those who have energy to spare can opt to visit this beautiful site before starting to bike above the Tolminka river to the town of Tolmin. The stunning two-hour descent from Mt Matajur is definitely the highlight of the day. And yet again, whoever goes down must first bike up, all the way to the top of the hill at the Slovenian border with Italy (1642 m). Besides the amazing descent, the tour group is awarded with fantastic views over the Soča valley as well as the Friulian plains and the surrounding mountains. 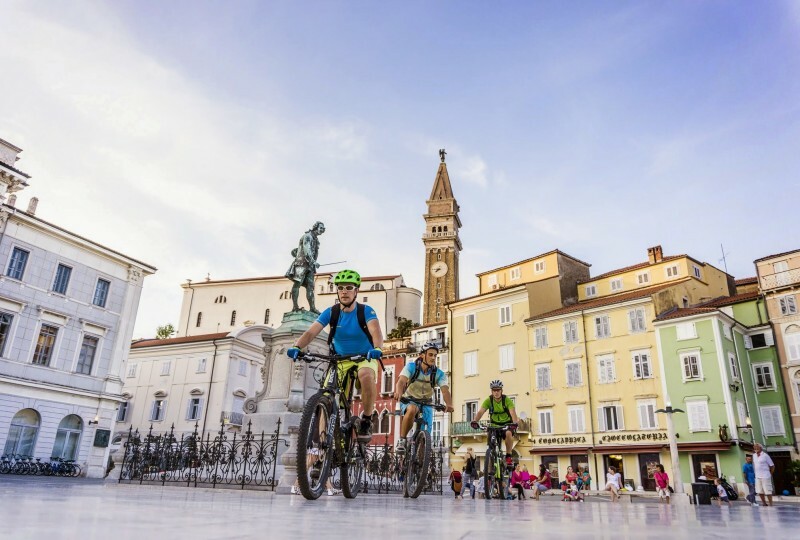 What follows is pure fun – an amazing downhill ride to Italy, where the group stops to try some delicious Italian ice cream or pizza in a charming small historic town of Cividale del Friuli. Leaving the mountains behind, it is time for some easy biking through the vineyards of Collio in Italy and then back to Slovenia, to the village of Šmartno in the region of Goriška Brda. With the land of gentle, rolling hills covered in orchards and vineyards and dotted with small, secluded villages, the region of Goriška Brda reminds of Tuscany. The wine growers here are famous all over the world for their high quality wine and hospitality, and a wine connoisseur would recognise many of the names signposted along the road, while biking across the beautiful hills. Needless to say, wine tasting is inevitable here and as far as food is concerned – well, the hills overlook Italy. Enough said. The longest biking day is all about Karst. Did you know that Slovenia is literally the land of karst? It was the Slovenian Karst that lent the name to the karst landscapes and phenomena all over the world, for it was here that scientists were first able to explain the numerous karst features. Speleologists discover new caves in Slovenia every year, and the number of recorded ones now amounts to more than 8,000. However, only about 20 of them are show caves. Besides that, the Slovenian Karst is the wine-growing region, which was praised even by the ancient Greeks and Romans. The Karst Wine Route boasts more than 100 wine cellars, where visitors can taste and explore the wealth of Karst wines. Although the landscape is different here, it is again full of vineyards and small ancient villages situated on the hill tops and featuring the traditional houses built in stone. The day ends with another surprise. Did you know that the noble white Lipizzaner horses originate from Slovenia? Their original stud farm has been located in Lipica, in the Karst region, since 1580. At the end of the day, the group can admire the beautiful animals or even do some horse riding. The last day of the Trans Slovenia 01 biking tour truly wraps up the diversity of this small country and of the tour itself. The route first leads up to a popular local hill, eventually reaching the Socerb castle that was built on the ruins of an Illyrian hill fort, which has withstood the northern bora wind and ravages of time for centuries. It overlooks the Gulf of Trieste, offering some spectacular views. This is the western edge of the Karst plateau, which is known as the Karst rim. A descent down the steep stairs leads to the Osp valley, which serves as a passage through the karst and coastal region of Istria. Osp is one of the oldest villages in Slovenia, being first mentioned in 1067. The village is well known for its rock walls, which provide free climbing opportunities all year long. 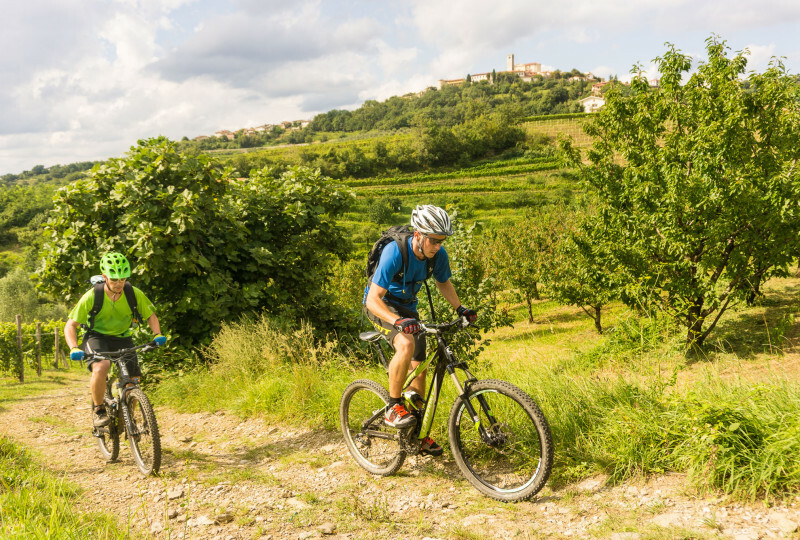 Next, the trail descends to the sea level, approaching the city of Koper, which is situated along the country’s 47-kilometre coastline, in the Istrian Region. From there, it follows the Parenzana railway track, a now defunct narrow gauge railway that was in operation from 1902 to 1935 and used to connect Trieste and Poreč. Following the trail and passing through some tunnels on the way, the tour finally reaches the city of Piran, which, according to Lonely Planet, is a small slice of Venice in Slovenia, sitting pretty at the tip of a narrow peninsula, on the Slovenian coast. Its Old Town, which is one of the best-preserved historical towns anywhere on the Adriatic, is a gem of the Venetian Gothic architecture. The biking tour ends here. Make sure you do not leave without trying the delicious seafood and taking a dip in the sea. Rates per person are based on double occupancy. Rates for the pre-scheduled dates are based on group planning (6 pax). 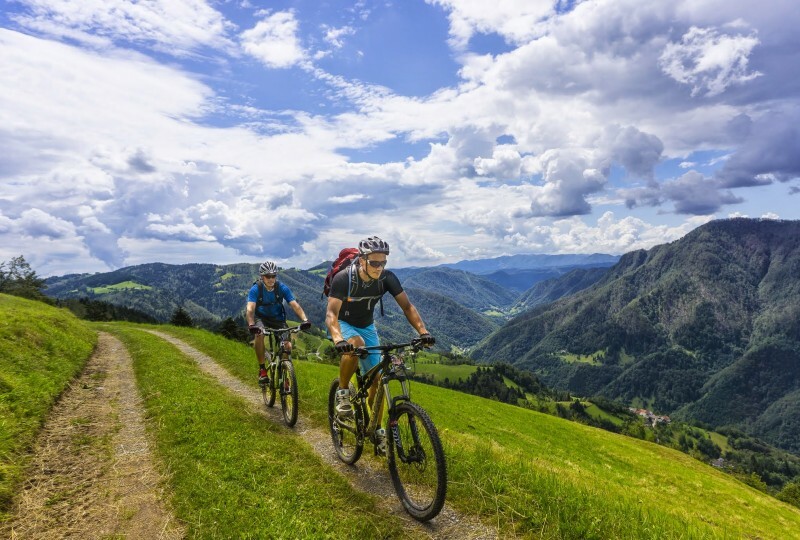 The travelling and activity insurance, personal safety and cycling equipment, lunches, beverages consumed with food that is included in the package, any other items not listed in the price. 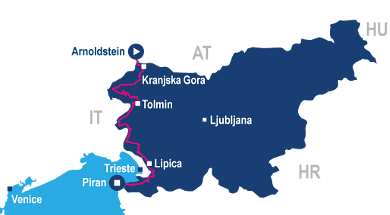 The adventure starts at alpine village of Kranjska gora and ends in the town of Piran on the Slovenian coast. Seven international airports, those of Ljubljana, Venice, Treviso, Trieste, Klagenfurt, Graz and Vienna, are located within the 150-minute drive from Kranjska gora. An airport shuttle from and to any of the seven airports can be arranged. One guided group can include a maximum of 8 people. Every evening a briefing session is organised, where the guide(s) reveal details about the next day’s tour, including the altitude, length, difficulty etc. 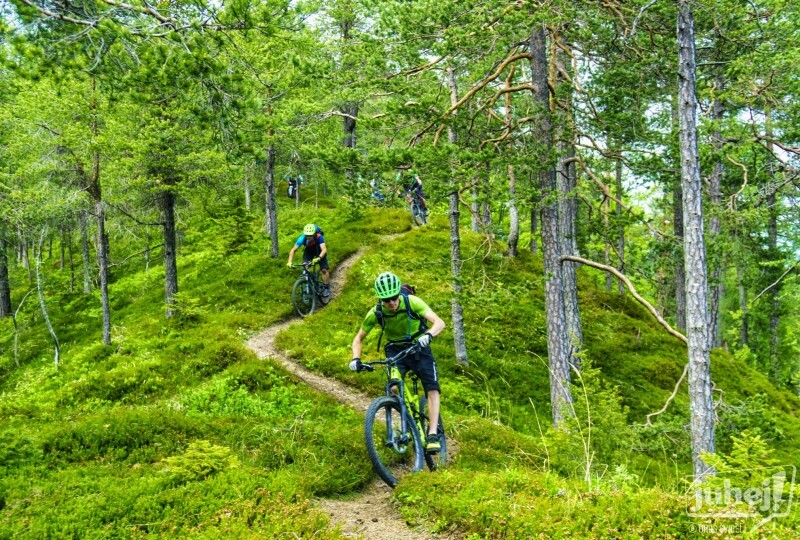 Alternative trails can usually be chosen to allow variations according to the specific requirement of each group.